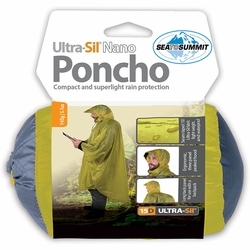 Sea to Summit Ultra-Sil Nano Poncho. Sea to Summit's 15D Poncho offers an even smaller packed size and weight for situations when you don’t need the versatility of our Tarp Poncho. Made with 15D Nano Ultra-Sil® fabric with fully taped seams, this poncho is ideal for use in hot climates where a regular raincoat just won’t offer enough ventilation. Also works brilliantly as an emergency rain cover in any situation.